Much of the following involves the Skerrett name, and I am in touch with a lady in New Zealand who is researching her Skerrett ancestors. especially those connected to the famous New Zealand Maori singer ‘Princess Iwa’ . If anyone who comes across this page has Skerrett ancestors perhaps you could contact me, and I will forward your mail to New Zealand! Herbert Skerrett, an Ullingswick farmer, was charged with sitting on his cart on the turnpike road without having anyone else alongside to take care of same. Herbert pleaded guilty and was fined a hefty sum of £1 12s 6d, or in default of payment, 14 days in prison. William was around 5 feet 7 inches tall with a powerful body, and a sullen expression. He appeared to be calm when he first arrived in court, became more nervous as the case progressed. A twitching of his hands and face was noticeable. A man named Thomas Weaver discovered the body of a girl in the meadow; she was covered in mud and blood, and it was clear that not only had she been raped with considerable violence, but she had also been suffocated. Mary was a well behaved girl of around 16, who had been working as a servant to Mrs. Skerrett for about 2 years. On the night of the murder, Mrs. Skerrett had sent Mary to a nearby shop (which was also a beerhouse) to buy candles and other things, but she forgot the candles so had to return to get them. At around 10 she again left the shop, and was never seen alive again. It was not far from the shop to where Mary’s body was found, and despite heavy rain during the night, it was clear that a severe struggle had taken place beside the road. There were marks as if a man’s knees had been pressed into the mud, and Mary’s hair net was found nearby. William Hope – as a boy he was known to be lazy and idle, and changed little as he grew into manhood. He refused to work if he could avoid it, preferring to partake of the vices of the beerhouse; sometimes to get money or drink, he would offer to wager that he could chew a pint jug, or glasses, or perform a few sleight of hand tricks. Suspicion immediately fell on William Hope, who had been in the beerhouse when Mary first went in – he had offered her beer, which it seemed she accepted. He was also there when she went back for the candles, and once more offered her beer, but this time she declined. As soon as Mary left, he put down his beer and went outside – although he lived some 300 yards from the beerhouse, he did not return home that night, and was not seen again until a lad spotted him the following morning, coming out of a plantation close to where the girl was found. A frail full of turnips that he had left outside the beerhouse was found close to the scene of the murder, as was his jacket. The doctor examining Mary’s body said that he found marks on the mouth as if someone had used their hands to press down……..the marks remained until the following day, and there were corresponding thumb marks under her chin. The skin was excoriated by the extreme pressure used. He went on to say that death was by suffocation, and that an extremely violent violation had taken place. The trousers that William Hope was wearing were unusual in that they were cotton cord, and had a patch on the knee which exactly matched the marks in the mud described above. There were also blood splashes on the trousers. Also of importance, was that William had been bitten on a finger, and this began to fester until it affected his whole hand and needed treatment whilst he was in custody. After a lengthy case, where many witnesses were called, the jury retired – after a fairly long consultation, they returned a verdict of Guilty. The Judge then passed sentence of Death, but the family of William Hope were rather less than happy. His mother tried to get a memorial signed on behalf of her son for presentation to the Home Secretary, with a view to obtaining a commutation of the sentence passed. She tried to get the sympathy of the Clergy too, but understandably had little success. 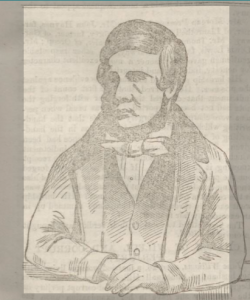 William Hope’s brother, an epileptic who had frequent fits during the trial, also seemed to be angry about the whole outcome,and he threatened all those witnesses who contributed to the outcome of the trial. It was said that the “morose, sullen, and dogged demeanour” that William Hope had exhibited, gradually left him, and he lay in a very depressed state. He was still eating, but only a little, and sleeping fitfully. William Hope was executed on the front of Hereford County Gaol on Wednesday 8th April 1863. As William stood on the fatal drop, he confessed his guilt saying “I don’t deny having done it, but not intentionally, and it would never have happened if she had not waited for me out in the road”. It was not long before the incident was dramatised, much to the disgust of Herefordians. A group of strolling players arrived in Ross on Wye to perform a play based on the Ullingswick murder, and they paraded through the town to announce the dramatisation. They performed the play in a tent by the river, and every part of the crime was shown, including the hanging. Many people claimed to be hugely disgusted and shocked by the distasteful action of putting on this play, but it was an absolute sell out and the tent was packed full. The beerhouse at Ullingswick, where Hope first saw Mary Corbett. The road where the murder was committed – drink and its consequences. The angle in the road 140 yards from the house – the horrid deed. The village of Ullingswick – Susan’s lecture on drinking. The great trial scene, the whole stage being converted into a court house, with all its necessary appurtenances. The Trial of the murderer. Open country near Ullingswick – the timid witness. The condemned cell – the murderer asleep – the vision – the murderer’s ferocity depicted. Street In Hereford – the last dying words, speech and confession. Again the condemned cell – the penitent murderer – the last farewell. Mrs. Sirrell of Ullingswick was travelling to Bromyard in a gig with her daughter, when the horse suddenly became unmanageable and bolted down the hill. In it’s panic, it ran at speed into the shop of Mrs. Hill of the Library, breaking much glass – both Mrs. Sirrell and her daughter were thrown out of the gig, and although severely shaken up were uninjured. The gig was damaged, but the horse was fine. John Skerrett of Dundercamp, Ullingswick was a 79 year old retired farmer; he was charged with trying to kill himself by cutting his throat on 14th November. James Ruck, a labourer of Ullingswick who worked for John, said that on 14th he found John sitting by his fireside and complaining of pain in his side; he advised him to go to bed. Sidney Davies, nephew of John Skerrett, said that he was in the kitchen on the afternoon in question and John was upstairs in bed. Suddenly he noticed blood running through the floorboards above, so ran upstairs. Sidney found John hanging over the side of the bed with blood running from his throat. Help was called for, and a cloth was tied around the wound in John’s throat whilst someone went to get the doctor. Neighbours kindly cleaned up the blood and tidied up before the doctor and policeman arrived. A bloodied razor was found on a chair by the bed. The doctor stitched up the wound, and decided that John was suffering from temporary insanity. No relatives would agree to be responsible for looking after John, so he was sent to the prison infirmary at Hereford. William Allman, a forty five year old farm labourer known as “Cronje” who came from Shropshire, had been employed for over a year by Mr. Herbert Skerrett of Gobbett’s Farm, Ullingswick. One Saturday he was paid off as he wanted to go hop drying, but instead of doing this he spent two days drinking heavily. Then on the Wednesday morning he was found dead. At the inquest it was learned that William was a known drunk, who after a particularly long session would sleep in outbuildings for two or three days at a time. He was described as flabby in the flesh although emaciated, with dark purple skin; when discovered, his body was filthy and absolutely reeked – it was also crawling with vermin. The verdict was death from natural causes. Emma Trowman aged 20, from Cradley Heath, had been suffering from a slight cold. Very soon though she took a rapid turn for the worse and she died in a barn at Criftage Farm, Ullingswick. Dr. Hallsworth of Bodenham certified that death was due to inflammation and stoppage.